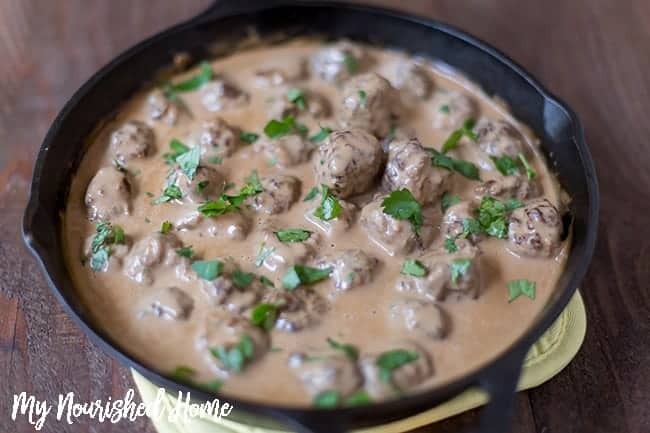 This Swedish Meatball Recipe is rich a flavorful without all the kitchen time that usually includes. 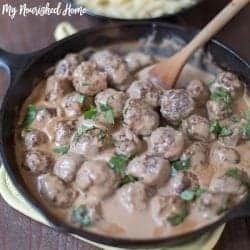 I used to think Swedish meatballs were things you microwaved in a package from the freezer section until I actually tried making them myself. These are a whole other level of delicious. Making this meatball recipe in bulk is ideal for meal planning. You can freeze the meatballs for a quick dinner later! When I meal plan with Swedish meatballs, I ALWAYS double the recipe, bake the meatballs, and then store half of them in the freezer. Later on, on a night that I only have a few minutes to make dinner, all I have to do is thaw the meatballs and make the sauce. Doing this cuts the cooking time to about 15 minutes, which is perfect for a busy weeknight. The easiest way to cook the second batch, it to move them from the freezer to the refrigerator the night before then just heat them in the skillet you use to make the sauce. Once they are hot, set them aside, made the sauce in the skillet, then add the meatballs back in and toss to coat. I do prefer the sauce made fresh instead of freezing it with the meatballs. 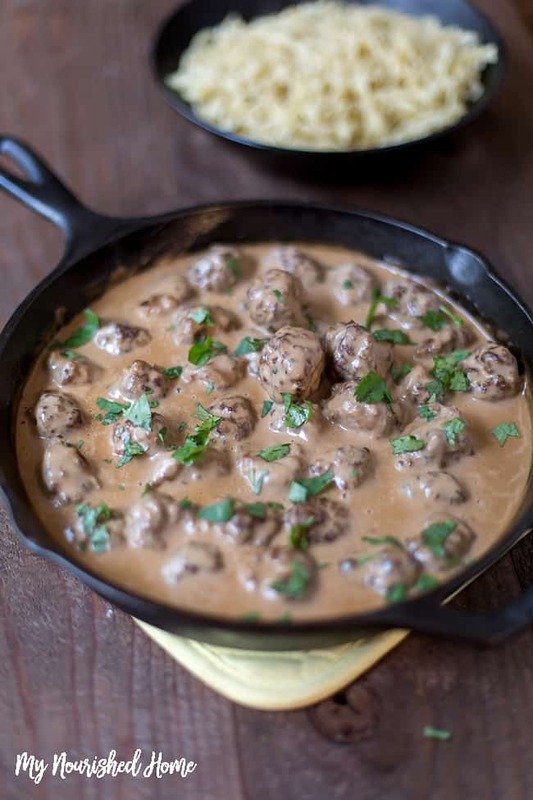 Swedish meatballs are very kid friendly – especially when served over mashed potatoes or egg noodles. 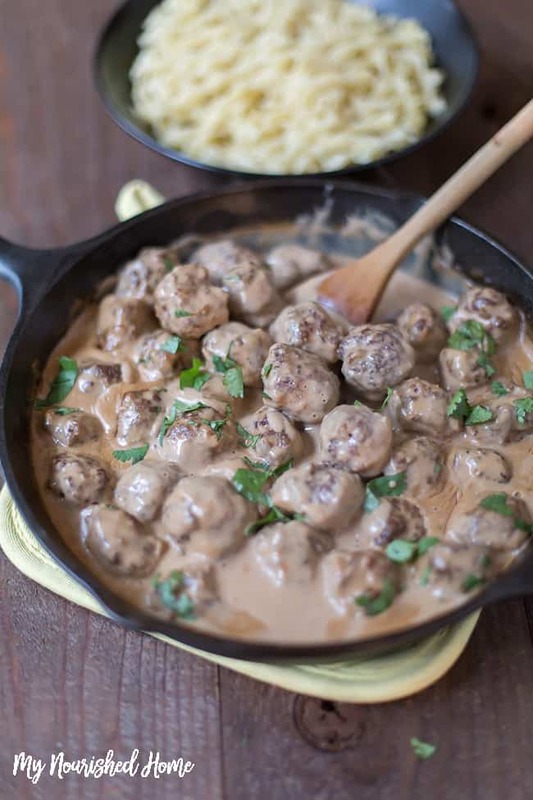 Be sure save enough of the creamy Swedish Meatball Sauce to pour over your noodles or potatoes because the sauce is what makes these already good meatballs, irresistible. 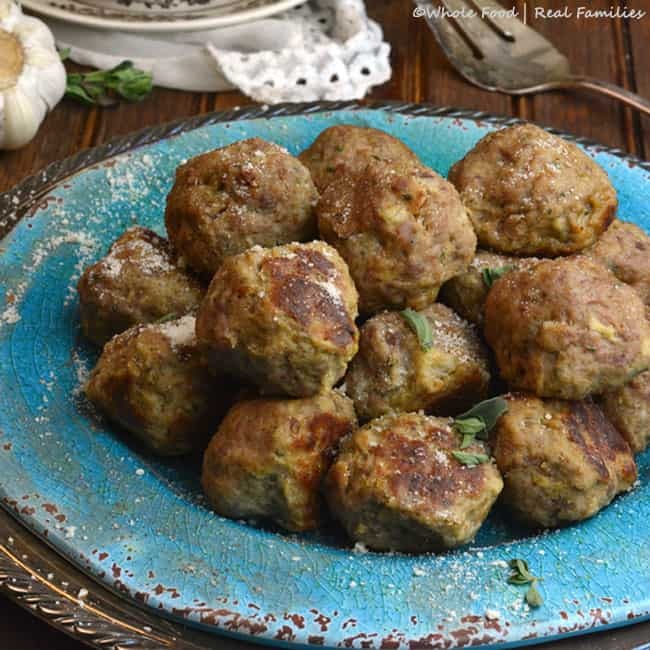 My family is obsessed with this meal and even if you didn’t cut down on the time by cooking the meatballs in bulk it is still a simple recipe that you can whip up on a busy weeknight. This Swedish meatball recipe is the definition of comfort food and there is nothing I love more than a cozy night in with a meal like this one. Looking for meatballs with a little more kick? These Awesome Meatballs have a little hint of spice and are amazing in red sauce over pasta, make an amazing meatball sandwich – or in the case of my kids, are awesome on their own with ketchup. Like your beef a little bigger? 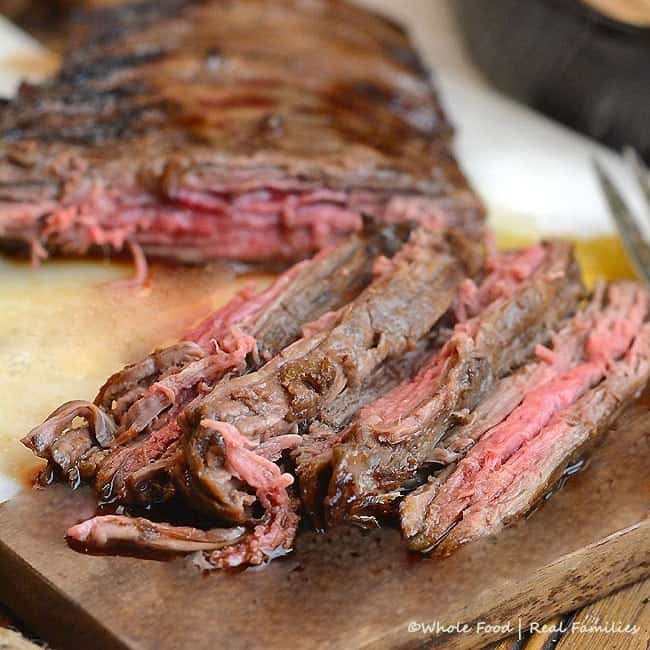 How about a Cast Iron Flank Steak. Whoa… Big beefy flavor and cooks in minutes in a cast iron skillet – which makes it perfect for weeknight dinners. Preheat oven to 350. In a bowl, combine all meatball ingredients above and shape them into 18 - 20 small meatballs. Bake for 25-30 minutes, or until they have browned. In a large pan, melt the butter and add the flour and garlic. On medium heat whisk until it turns a brown. Pour the beef stock and keep whisking, trying to remove all the clumps from the flour. Next pour in the heavy cream, stir and allow it to simmer until it thickens. Add the dash of the Worcestershire sauce. Check for salt. Immediately, add the meatballs into the sauce and coat them evenly. Serve with egg noodles or eat just like they do at Ikea, with some mashed potatoes and lingonberry sauce. So so so so yummy!